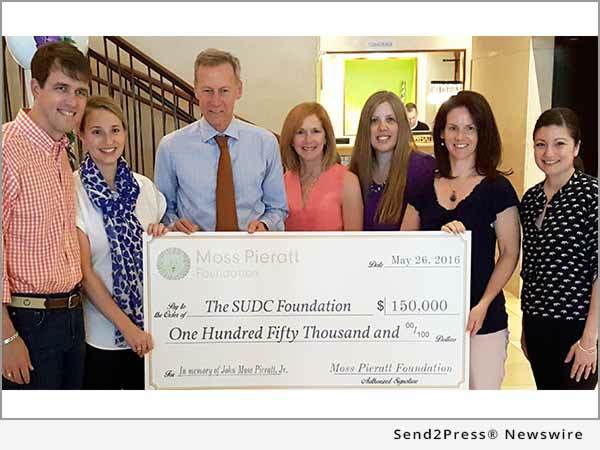 NEW YORK, N.Y., Jul 20, 2016 (SEND2PRESS NEWSWIRE) -- With a $120,000 commitment, the SUDC Foundation is excited to announce the support of “The Moss Pieratt Foundation Memorial Neuropathology Fellowship" at NYU Langone Medical Center’s Comprehensive Epilepsy Center. Neuropathology is the study of disease of nervous system, which includes the brain and is crucial to our better understanding of Sudden Unexplained Death in Children (SUDC). To date, there are no comprehensive brain studies on victims of SUDC. The fellowship, made possible through a gift to the SUDC Foundation from the Pieratt family, will be used to support research over the next three years into SUDC, a diagnosis of exclusion given when all known and possible causes of death have been ruled out. “It is amazing to see the commitment of SUDC families, like the Pieratts, affected by such a devastating tragedy who somehow find the strength and courage to support our mission. To date, SUDC receives no public funding, so gifts like this enable us to not only improve our critical care to bereaved families in the traumatic aftermath of the death of a child, but to pursue groundbreaking research into the underlying causes of SUDC which can lead to its ultimate prevention,” said Laura Crandall, Executive Director of the SUDC Foundation. The fellowship will reside in the laboratory of Orrin Devinsky, MD, professor in the Departments of Neurology, Neurosurgery and Psychiatry, and Director of Comprehensive Epilepsy Center at NYU Langone and the Conformational Disorders laboratory of Thomas Wisniewski, MD, the Lulu P. and David J. Levidow Professor of Neurology and professor of Pathology and Psychiatry at NYU Langone. “The incidence of SUDC among children 1-18 years of age accounts for about 344 deaths per year, with 202 of the deaths among children ages 1-4 years. SUDC is also the fifth-leading cause of death in children aged 1-4 years in the United States, yet, public health efforts and public funding for its research has been minimal,” said Dr. Orrin Devinsky. Arline Faustin, MD, the first Fellow to receive the award, will enhance crucial neuropathology efforts by the SUDC Registry and Research Collaborative (SUDCRRC) at NYU Langone. “I am deeply honored to be receiving this fellowship and dedicated to providing comprehensive and novel neuropathology studies in SUDC. The tragedies surrounding SUDC are immense and I am inspired by the many families affected who enable our research at the SUDCRRC to continue and grow,” said Dr. Arline Faustin. Though he was just short of turning fifteen months old at the time of his death, Moss Pieratt made an indelible impression on those he met, whether friends, family or complete strangers. Moss simply delighted in the company of others and truly loved people. Music was a common thread throughout Moss’s life, whether listening to Wee Sing Bible Songs at home (or in the car) or attending music class with friends in Houston. These memories and attributes, above all else, capture the spirit of Moss and how his family and friends remember him to this day. A little more than a year after the death of John “Moss” Pieratt, Jr., the Pieratt and Jenkins Families jointly decided to start a foundation that would honor the cherished life of Moss, raise funds and awareness to find a cause or cure for the sudden unexplained death in children over the age of twelve months and provide a civic benefit to the citizens of Austin Texas. Moss’s parents John and Jessica Pieratt along with his grandparents Bobby and Jan Jenkins traveled from Austin to New York City this past Memorial Day weekend to make an official check presentation to staff members of the SUDC Foundation. The SUDC Foundation is dedicated to increasing awareness of sudden unexpected deaths in childhood, funding crucial research into the causes and prevention of SUDC, and advocating for the needs of families affected by these tragedies. The SUDC Foundation is the only organization devoted solely to the needs of families and professionals touched by unexplained death in childhood. Since its creation in 2001, formerly as the SUDC Program, it has granted approximately 1.2 million dollars in support and research grants and continues to work toward its mission of a future free from SUDC. Today, it serves over 700 families worldwide and that number continues to grow. For more information on Sudden Unexplained Death in Childhood and ways to support the foundation please visit http://sudc.org/. FACES is affiliated with NYU Langone Medical Center’s Comprehensive Epilepsy Center. FACES funds research to improve epilepsy care, advances new therapies, and fosters a supportive community for children, families and caregivers who live with the challenges of epilepsy.